The beta release of version 5.03 of Activ E-Book Compiler is now available. For details Click here. Version 5.03 adds a number of important security fixes, and we believe it is by far the best of the 5.0x beta series so far. That said, it is still a beta release, so bear that in mind if testing the software. (And as mentioned on the download page, please do not distribute eBooks made using the beta version). One related topic that I thought would also be commenting on is the general security of installing eBooks or other files on your computer. Does the eBook/file do what the author intended (or at least programmed - there’s no accounting for bugs)? Does the user of the eBook/file trust the author and distributor of the eBook/file? The improvements in version 5.03 are really intended to address the first point. As regards the second point, it is not really something that we are able to address. This is because the EXE files created by Activ E-Book Compiler are programs, and as such can do whatever the author/distributor wrote into them (particularly by using the scripting features and APIs in Activ E-Book Compiler) . This places a great deal of power in the hands of authors and distributors - and with great power, comes great responsibility. A long time ago, we considered carefully this issue, and came to the conclusion that we wouldn’t attempt to artificially limit authors’ power, because we wanted to allow authors to produce better and more sophisticated products. Moreover, being EXE files, any attempt to artificially limit authors’ power would be doomed to failure - because they could either “patch” the EXEcutable (there are tools a sufficiently skilled person can use to patch any executable), or they could simply use another tool (such as a programming language like C++, Delphi or Visual Basic), to produce EXE programs to do whatever they wanted. In case you are wondering why I am considering both the author and the distributor - the fact is that a sufficiently skilled distributor, with the right tools, could alter/patch an eBook EXE (or in fact any EXE) to do something other than the original author intended. While it may not be particularly likely (a malicious distributor would probably find it considerably easier to simply create their own malicious program rather than subvert somebody else’s existing program), it certainly isn’t impossible either. In other words, all EXE files (whether made using our compiler or some other tool), always carry the possibility of security risks. Want to write an eBook that processes forms locally? You can do that with Activ E-Book Compiler. Want to write an eBook that remembers information (like the user’s settings) in a file? You can do that with with Activ E-Book Compiler. Want to write an eBook that allows users to pick the graphics they want, and save them to their hard-disk for later use? You can do that with with Activ E-Book Compiler. Want to write an eBook that can play full-screen videos? You can do that too with Activ E-Book Compiler (it doesn’t include a built-in feature for this last one, but you could use the Multimedia Extension to incorporate this function. The first thing to remember is that there would be a lot less content (and much of would offer much less) without the EXE format. Aside from eBooks, have you thought about all the programs, utilities, and so on we use in our every day work? What would you do without them? Additionally many files that a non-technical user might think are purely "content" (as opposed to programs), can in fact contain executable content of one sort or another (often scripted content). Often, the viewing applications for these formats do contain restrictions, designed to prevent the content performing potentially malicious actions, but even then, "exploits" (which may allow such executable content to break free of these restrictions) have been found from time-to-time in many applications. Sometimes these exploits are the result of bugs in the viewing software, and sometimes as the result of simply tricking users to accept actions (for example in security warning dialog boxes) that they shouldn’t have. This and this news report from 2001 describe a virus that apparently can travel in PDF files. Another news report from 2004, describes an exploit for Java applets, which allows them to escape from their "sand boxed" (protected and restricted) environment, and potentially get access to other files on users’ PCs. There has even been a virus which spread through Microsoft Word macros. Now, the particular exploits that are described in those news stories have probably been fixed by now (you’d need to check with the vendors to be sure). And, if you use anti-virus software (such as Norton Internet Security) and keep it up to date, it would help protect you from known viruses. But, the stories also illustrate my point - there could be potential security vulnerabilities in many different file formats. EXE files are programs, which as I said gives you a lot of power, but also a lot of responsibility. Remember EXE files are programs, and as such, if incorrectly or maliciously programmed (or modified by somebody after they were programmed), could do something you don’t want. You need to bear that in mind when deciding what to download or install on your computer. The other side of the coin is, that if you want an eBook or application with feature X, or do Y, then often EXE is the only choice - because the features you want may not be available in any other format. A bug in the viewing software that a malicious file can "exploit" (more likely, of course, if you don’t keep up to date with the latest patches and security advice from each application’s vendor). So, you’ll need to bear that in mind too, when deciding what to download or install on your computer. If you were to take this to its logical extreme, and if you were truly paranoid about security, you’d never install any files on your computer, and you’d disconnect from the Internet right now (because viruses and worms and malicious programs have all been known to spread via email, or in some cases by simply browsing websites using a browser with a security weakness)…. but then how would you get any work done? And my final advice? Take regular backups of any data that you can not afford to lose - and keep that at a separate geographic location away from your computer (preferably in a fire-proof safe). This will help protect you not only from computer security threats, but from most other disasters too. I recently wrote about midPhase’s 2 months of free hosting deal. Well, I received an email from another hosting company today, PowWeb who are offering a range of exceptional deals. In fact, PowWeb have a choice of 3 special deals on their $7.77/month hosting plan (which includes 5,000 Megabytes storage, a massive 300Gb/month transfer, and a bunch of features). All PowWeb’s deals also come with a free domain name and setup. Either buy 1 year’s hosting - and get 2 months free. I believe this deal ends at the end of October. Or, buy 2 year’s hosting - and get 2 years free. I believe this deal also ends at the end of October. Or, get $5 off any package by entering code "sept05" at the check out. Hurry up if you want this deal - it ends 30 September. Well, I guess I’ve potentially opened the floodgates and now I’m going to receive email from other hosts about other special deals they offer - in the expectation that I’ll write more stories on those lines. While that ain’t gonna happen - this is going to be my last story about hosting deals for a good while: let’s get back to eBook and Internet publishing! Activ E-Book Compiler version 5.02 Beta Release - Feedback Required Please! The beta program for Activ E-Book Compiler v5 is proceeding, and we’re now on 5.02. Details here. This version is the best so far, and I think it’s pretty close to being a release candidate. But we need your feedback! If you have found any bugs or problems let me know. If you have not found bugs or problems - also let me know - including what specific features of the compiler you’re using (e.g. passwords, expiry, own table of contents, etc., etc.)! The best way would be to post in the discussion thread, but if you prefer you can email us instead. midPhase is offering two months of free hosting (and the chance to win a car). To get the free 2 months, all your have to do is enter a coupon code (see below), when ordering. midPhase’s plans include 5,000Mb of storage, CGI, PHP and MySQL features, $100 of Overture credit, and unmetered* bandwidth. The prices start from US $7.95 per month. *If you look at the small print at the bottom of the midPhase’s site, it says "Regarding Mega-PHASE, Pro-PHASE, Windows and Windows Pro customers: Some sites may not qualify for Unmetered Bandwidth. In the event that a website does not qualify, the website will be allocated 65-75 GB of bandwidth depending on the package." That looks like a very good deal to me, even if you don’t qualify for unmetered bandwidth. Oh yeh, the coupon code - it’s "twomonthsfree". Go to midPhase and sign-up now if you want it. I understand this offer will be ending fairly soon, mid October - I think. 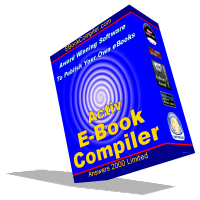 Version 5.01 of Activ E-Book Compiler is now available as a beta release. This supersedes the version 5.00 release. Details here. The only real change is that 5.01 can be used with language files (e.g. translations to French, German, Italian, Spanish, etc.) that have been prepared with version 4.22 of the compiler. We’ve set up a web page which explains which language files are compatible with which compiler versions. As you may be aware it is possible (see Advanced Features in our Help) to translate the menus/dialogs/etc. in eBooks created with Activ E-Book Compiler. Many of our users have been kind enough to share the translations that they have prepared. There’s a new addition to the arsenal: an Italian translation courtesy of Elisabetta Petroni. For information and download instructions please go to http://www.ebookcode.com/templates/italian422.htm. We have just released version 5.02 of the Advanced Multimedia Extension for Activ E-Book Compiler. This allows you to create eBooks containing video (including full screen video), and sophisticated multimedia features. If you would like to see a demo, go here to download it. If you purchased a previous version, log-in at the member’s page, and you can get the upgrade free. And if you want to discuss it? We’ve started a discussion thread on our forum. We’ve go a new free eBook: 117 Ways To Increase Web Site Traffic. 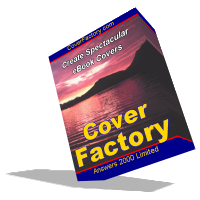 In this eBook, you’ll find lots of ideas for promoting your site, and we also allow you to distribute copies (rebranded with your affiliate links) from your web site. For detailed information and download instructions, please click here. We’ve just released the first beta of version 5 of Activ E-Book Compiler (our most popular software product ). The new version adds a whole host of features including tons of new scripting features, enhancements to rebranding so you can password protect individual rebrandable fields separately, and a lot more. You can see the finalized full list of improvements and updates in version 5: here. And if you want to download and try out the new beta version: go here for instructions.